This is a story of wars, revolutions, exiles and restorations; a parade of kings, queens, regents and pretenders. Its central theme is the fight for the throne of Spain between the Bourbon and Carlist pretenders, a fight which started in 1833. Both branches of the family abound in colourful characters: the shrewd Maria Cristina, the masculine Infanta Carlota, the sensuous Isabel II, the effete King Francisco, the suave Duke de Montpensier, the showy Carlos VII, the licentious Alfonso XII. 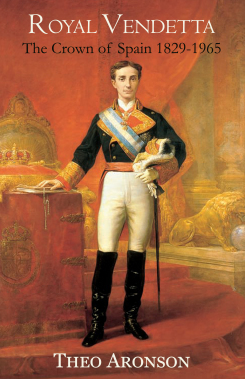 The drama is acted out in many countries in the court living in formal splendour in the Palacio Real in Madrid, Don Juan dying incognito in a house in Brighton, Isabel living out her voluptuous days in Paris, Carlos VII scheming in his palazzo on the Grand Canal, the future Alfonso XII at Sandhurst, the Infanta Eulalia in Chicago, the son of Alfonso XIII dying in a car accident in the U.S.A. When this book was first published in 1966, the spirit of Carlism was still very much alive; the Carlists had thrown their weight behind Franco in the Spanish Civil War, and the recent marriage of the Carlist pretender to Princess Irene of Holland had spotlighted the old feud.